Sent to Christchurch City Council 21 sec later. The westbound cycle lane on Marriner St is coned off by Fulton Hogan at the Nayland St corner without any advance warning to cyclists or drivers of this closure (unless you consider a “Shoulder Closed” sign as actually meaning that the cycle lane will be blocked!). 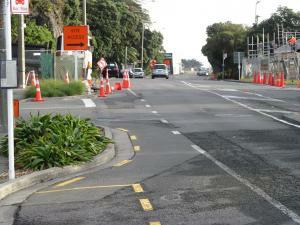 There also doesn’t appear to be any Traffic Management Plan for this closure (associated with house repairs) on the http://www.tfc.govt.nz/current-conditions/roadworks/ website. Cycle lane cleared, with cones and signs moved to kerb or berm.